A continuous process, updating individual and collective values, beliefs, perceptions, knowledge, traditions, skills and behaviors related to the everyday, rational and efficient use of water. The State Water Commission focuses on these issues to achieve positive and proactive change in individual and collective participation in the goal of sustainable water use, promoting communication and ensuring adequate water supply for future generations. – We teach “Water Culture” in elementary, middle and high school classes. – We promote tours to our facilities and to our water treatment plants. 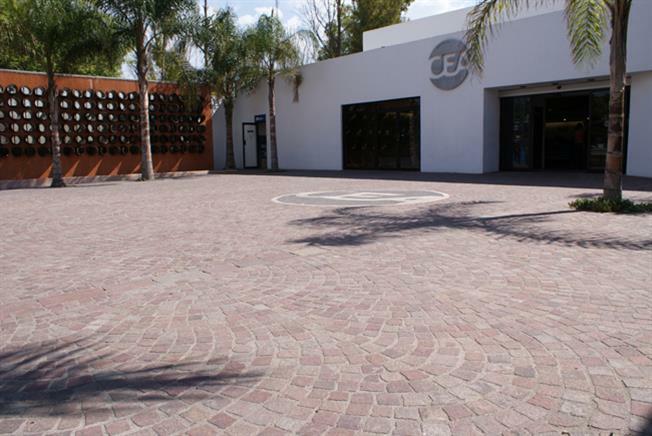 – We support ecological events organized by USEBEQ (Service Unit for Basic Education in Querétaro), and Environmental Weeks of different institutions. – We offer Environmental Education training for teachers and for “Water Culture” promoters. – We participate in fairs, expositions and cultural weeks in the State. – We offer to teach “Water Culture” in companies, and promote the use of water-saving devices. 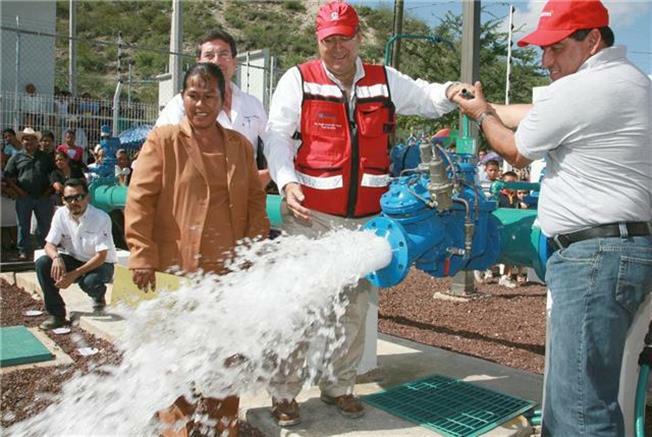 – We organize various events to celebrate important dates, such as the World Water Day. 1st Tip – If you wash your car use one bucket of water instead of using the hose. 2nd Tip – Taking showers rather than baths will save an average of 7,300 liters of water per year. 3rd Tip – Wash your teeth with a glass of water and rinse your tooth brush with a minimum amount of water. 4th Tip – Repair leaks immediately, a small leak that produces a drop per second wastes 4,320 liters of water per year. Also make sure that water taps are closed. 5th Tip – Never use the hose when you can use a broom. 6th Tip – Use washing machines and dishwashers with maximum loads and reuse greywater for irrigation or flushing the toilet. 7th Tip – Check periodically for leaks in the toilet, paying special attention to the toilet float and flush valve. 8th Tip – To check if there are leaks in the flush valve, place some colorant in the tank and if colored water passes, there’s a leak! 9th Tip – Keep children from playing with hoses or otherwise wasting water. 10th Tip – Check and change broken or worn pipes, fixtures, and valves. The colonial system of drinking water distribution in Querétaro consisted mainly of an aqueduct and a distribution network of terracotta pipe. The system remained in service with few changes until the end of the 19th century; a century and a half after it was installed by the Marquis of the Villa del Villar del Águila. In 1894 Eng. Francisco González of Cosío became Governor of the State. 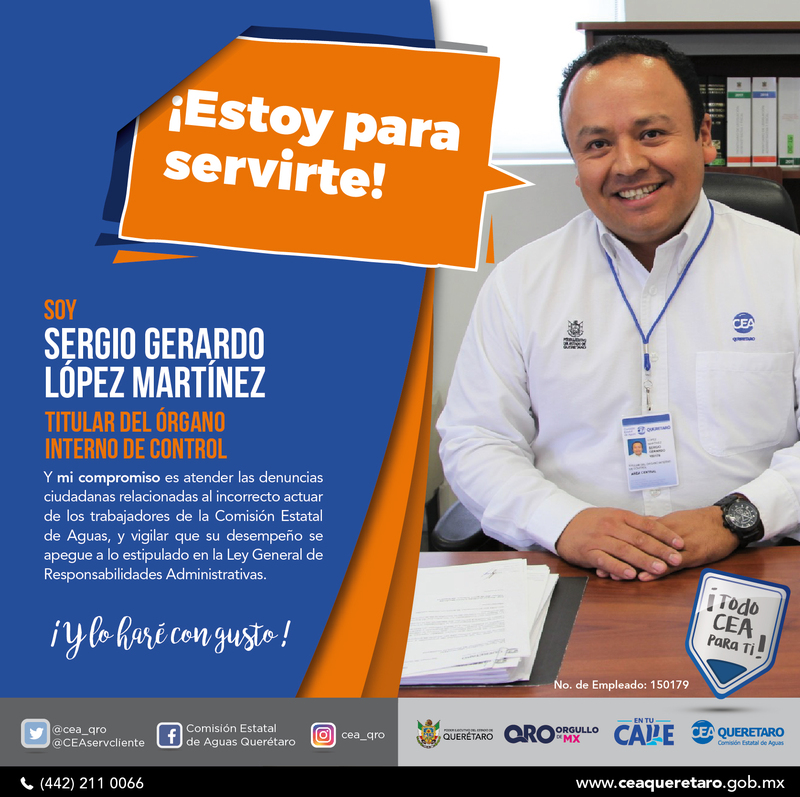 He served for more than 15 years and during that time, was constantly concerned with trying to increase the volume of water that was already scarce in the city of Querétaro, as well as its purity. The clay pipes that had carried water from the sources were in very poor condition due to the years of service. 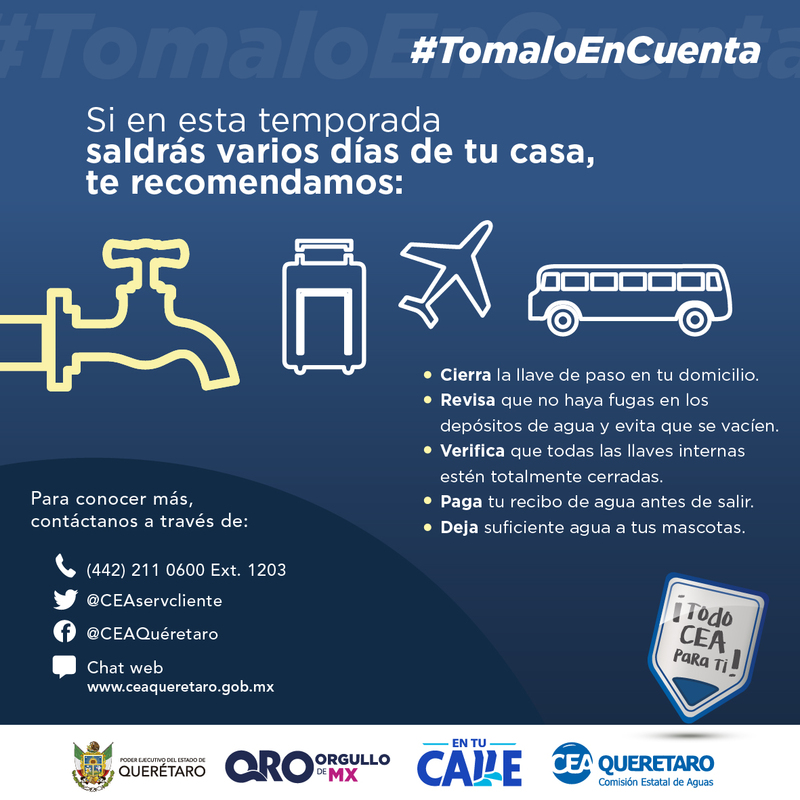 A change to iron pipes would address leaks, improve water quality and quantity, and be a health benefit for the residents of the City of Querétaro. By 1903 he had begun to construct a new aqueduct which represented a considerable investment. It was constructed mostly of iron pipe, all the way from the reservoir at old Hercules. Upon completion of the Project, the drinking water distribution system was significantly improved, with twice the volume of water being delivered to the City. In the 1940s, public health problems and the high incidence of gastrointestinal illnesses necessitated conversion to groundwater sources for water supply. For the first time, the City began to rely on deep wells to supply drinking water. The use of groundwater continued through the 1950s and 1960s. Groundwater represented a reliable source of clean water and proved to be an effective means to remedy endemic diseases that had plagued the residents for so long. Along with continued use of groundwater, the City witnessed the construction of new hydraulic infrastructure as part of the industrialization in accordance with the National Development Plan. Provide easily accessible and knowledgeable service to the population of Querétaro so that together we find solutions and achieve satisfaction. Establish excellent performance standards, based on continuous improvement, linking words with deeds, and facilitating public access to information. Exhibit loyalty to our commitment to defend our institutional beliefs based on our mission, vision, values and goals, as part of the obligation that we have to society. Strengthen our technical and human resources skills to efficiently meet our responsibilities and improve our institutional knowledge. Solve our problems systemically and systematically, orienting solutions to achieve optimum application of our resources for the benefit of the population and improvement of the performance of the institution. To be an example of environmental stewardship, especially with regard to the water resource. 1. Optimize the utilization of resources, with a results-based approach designed to maintain the profitability of the organization. 2. Achieve user satisfaction, with an approach to service that strives for efficiency and effectiveness of processes, optimization of response times, and promotes innovation and continuous improvement. 3. Promote growth of the organization’s talent by encouraging efficiency in personnel and material resources management, with competitive orientation and a high sense of social responsibility within a framework of transparency. 4. Promote and implement technologies to meet the challenges in matters of information management, infrastructure management, as well as for the prevention of risks from hydro-meteorological phenomena. 5. Contribute to the economic and social development of the State, ensuring that the population has access to water while promoting a culture of good use. 6. Implement actions to preserve the environment and the sustainability of water resources. The rainwater collection network is the infrastructure that provides for the collection and conveyance of rainwater to discharge points intended for this purpose. 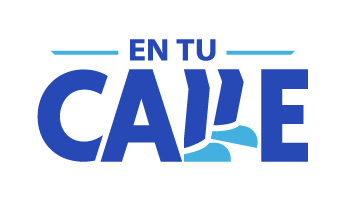 This network is composed of rainwater collectors, open drains, (including the Río Querétaro), and wave breaks. Rainwater collectors capture water in a given area, leading to drains to be discharged. The canals are works which capture and regulate water runoff, through a controlled system. The State Water Commission is responsible, in conjunction with the municipality, for the maintenance of 84 kms. 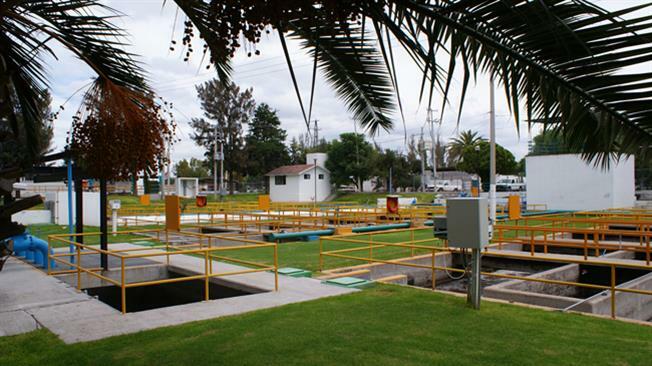 of open drains and the 12 control canals in the metropolitan area of Querétaro. The sewerage system consists of a network of pipes and manholes which, according to their function, are divided into sub collectors. They capture wastewater in a given area (housing development, industrial park, etc.) and convey it to collectors, which are networks of higher capacity. Collectors in turn lead to interceptors which discharge to treatment plants. 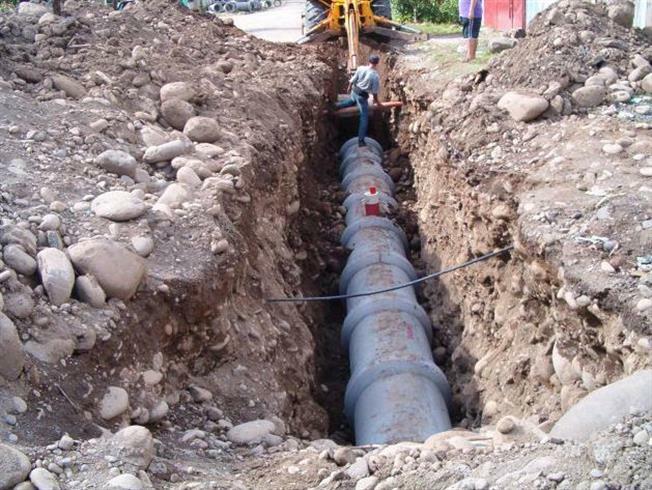 The State Water Commission is responsible for the maintenance of these networks with the construction of the same carried out by the Secretaries of Public Works of the State and municipalities. To date this year we have an average of 66% treated water reuse in the sectors above, , of which the majority is in agriculture. The State Water Commission operates 32 treatment plants in the State, which are regulated under Mexican Official Standards that establish maximum contaminant limits in sewage discharges.